The University of California at Berkeley is today best known as a great research center and popularly remembered as a locus of campus unrest in the 1960s. This memoir by the eminent sociologist and historian of ideas Robert Nisbet views Berkeley from a different perspective. Teachers and Scholars is a fascinating picture of Berkeley as it was a half a century ago in its move to become the most important center of learning west of the Mississippi. 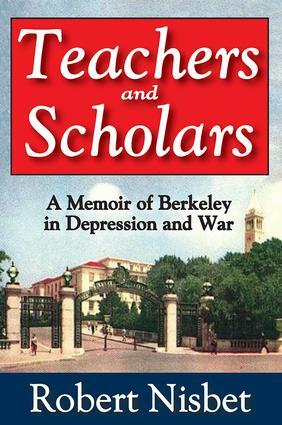 Nisbet recounts his years there as student and teacher, and offers vivid portraits of Berkeley's professors and personalities.Between the Great Depression and entry into World War II, Berkeley was a unique window on a Western world in turmoil. All the ideologies of the time�liberalism, socialism, populism, and fascism�impinged on the life of the campus. In Nisbet's view, the thirties was the last decade of "the old Berkeley"�a school that conceived its primary mission as that of teaching. Although research was expected of every faculty member, its chief importance was widely held to be in its elevating effect on undergraduate instruction.In the shift from teaching to research, some have argued that Berkeley has lost community and consensus while others claim that the university has only enriched itself. Nisbet finds much to respect and criticize in both views. His vision permits him to compare and contrast the Berkley experience with other schools such as Harvard, Chicago, and Stanford. Rich in intellectual and social history, Teachers and Scholars is vitally pertinent to the educational questions and controversies of our own time.